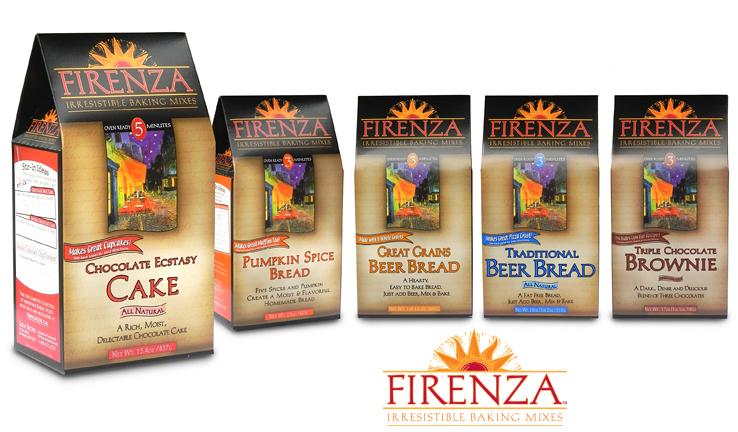 Firenza Irresistible Baking Mixes present an old world Tuscan-style and recognizable Caf� Terrace at Night that pop off the shelf. These premium bake mixes compete against major brand mixes successfully in all bake mix categories including bread mixes, savory breads, desserts and specialty item. The gable topped boxes have a bright shelf presence yet affords easy reproduction utilizing a common-process color base and spot-color variants for each flavor keeping production costs down for the client. 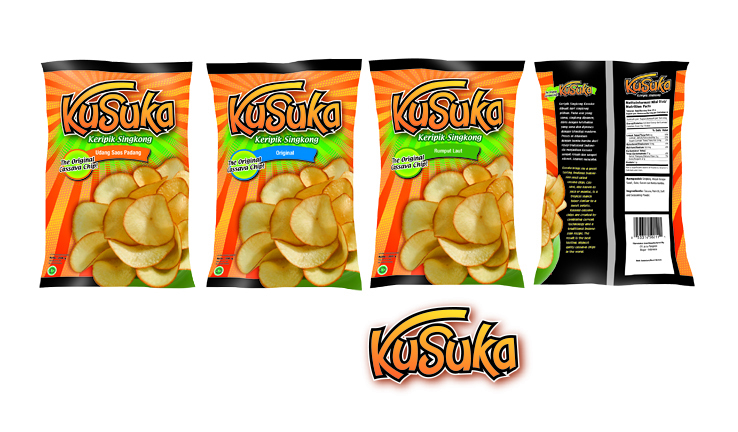 Tasty, crispy cassava chips in an assortment of flavors with self appeal for the health conscience snacking. 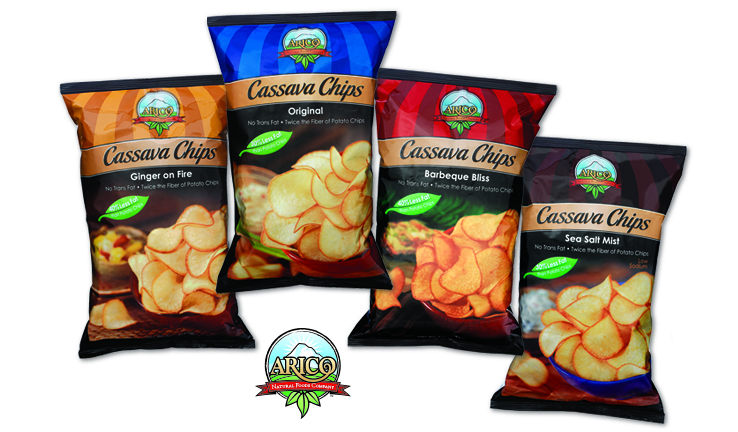 This line of Arico products incorporates the overall branding developed by Menzel Design by use of color and composition and prominately displays large variety photos designed into the overall branding. These flexo printed flexible heat-sealed foil laminate bags provide a stable shelf life and warm, rich tones to the design. A tasty assortment of gluten-free and dairy-free cookie snack bars. These cello wrapped bars are available for individual and case sales. 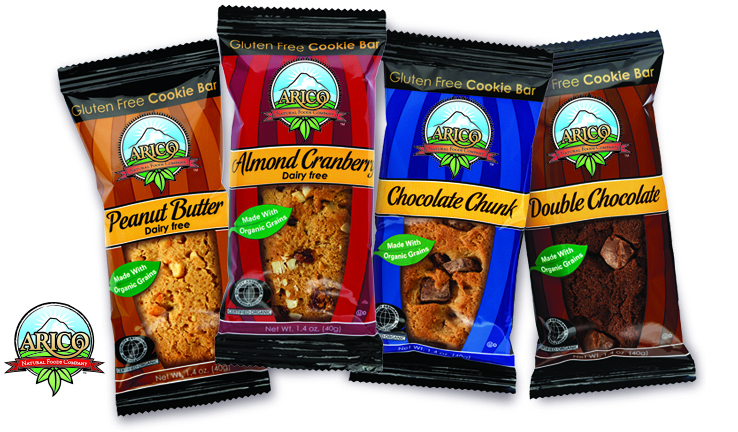 The cookie bar design shares the same identity-building brand design with the full family of Arico products. Rich colors accented with a crisp black allow for easy identification and shelf pop. A flavor for every taste! 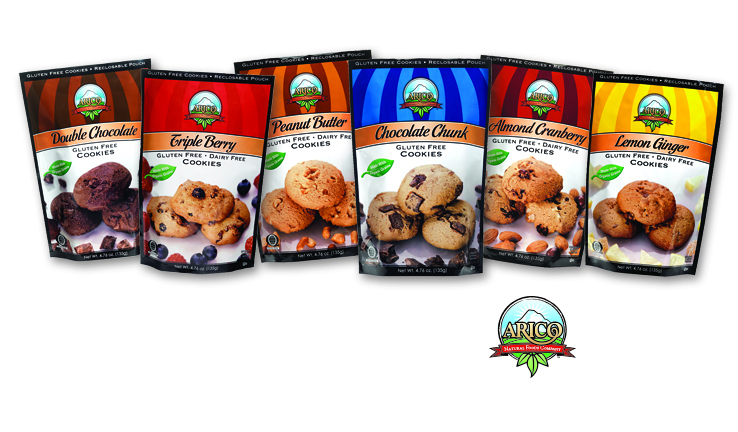 The full family of gluten-free and dairy-free cookies in flexible laminate pouches with resealable zip tops. The mainstay of the Arico family of products attract attention on the retail shelf with bold varietal colors, easy identification and beautiful large imagery of the product within these gravure printed pouches. Beautiful and bright packages encase hand-picked premium teas. 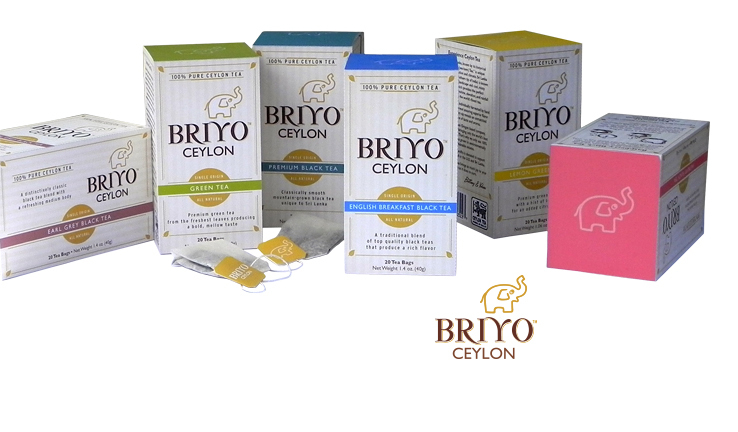 Briyo Ceylon tea is imported from a private plantation on the island country of Sri Lanka. This enterprising young company offers the six most popular flavors of both green and black tea. Individual tea bags are each branded with colorful wraps and tags and lay within a coordinating varietal colored box with a touch of nostalgic flare that highlights the brand logo and baby elephant. Elephants are an important cultural symbol of Sri Lanka. 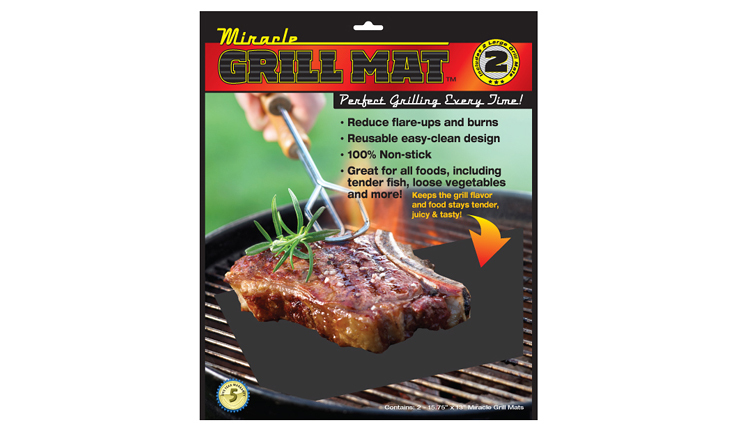 Miracle Grill Mat is one of many quality consumer products offered by Golden West Marketing. This boldly designed envelope-style package measures 13" x 18" for large retail facing. Package front is die-cut to reveal the product and easy visual reference of how product is utilized. 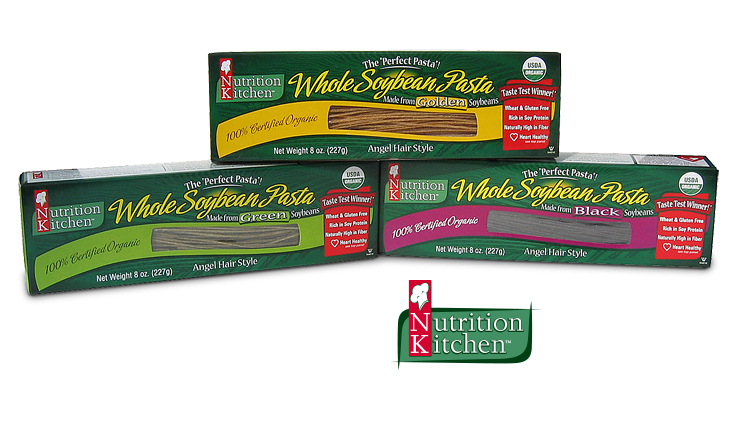 Pure soybean 100% organic pasta made with yellow, green and black soybeans and no other ingredients. These natural pastas are very similar to wheat pasta but add a nice umami taste appeal and toothy texture that compliment sauces of all types. These process-color printed boxes evoke the tender bend of a cooked noodle with window to allow the consumer to see the product within. An Indonesian based company needed a face lift to its very strong shelf presence throughout Asia. This redesign to the flexible fin-sealed poly laminate bags did just the trick. The various flavors share a common base design to "jump" from the shelf! The gelatin that wiggles all the right ways. 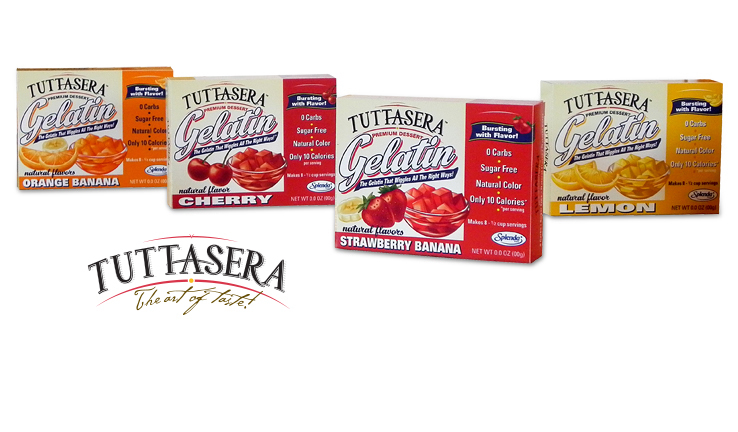 These premium, sugar-free gelatins pack a powerful flavor punch in a mix of fruit flavors. Made with all-natural ingredients the box fronts present fresh and bright fruit illustrations that provide quick varietal reference and indication of the flavor appeal and boldness of flavor. Mattress and box spring labeling system for Sealy Posturpedic mattresses, Costco International. These large adhesive backed labels present a comforting and inviting visual to the consumer. 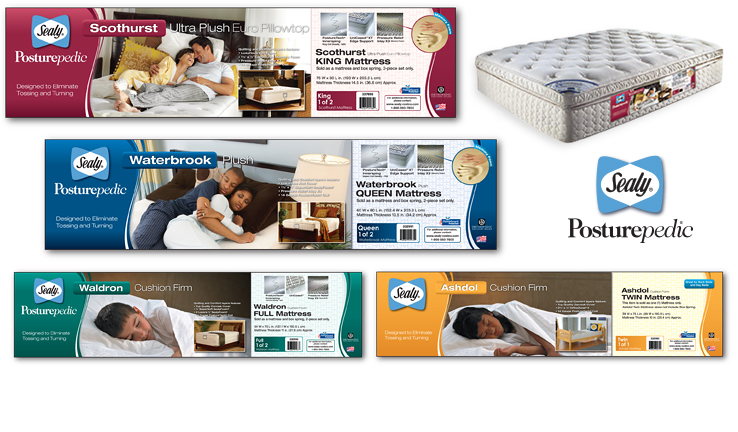 Labeling instructs and educates of the features and benefits found with each size and comfort level mattress set. A test market release by MedoSweet Dairy of premium milk products in a three-quarter gallon, opaque jug. 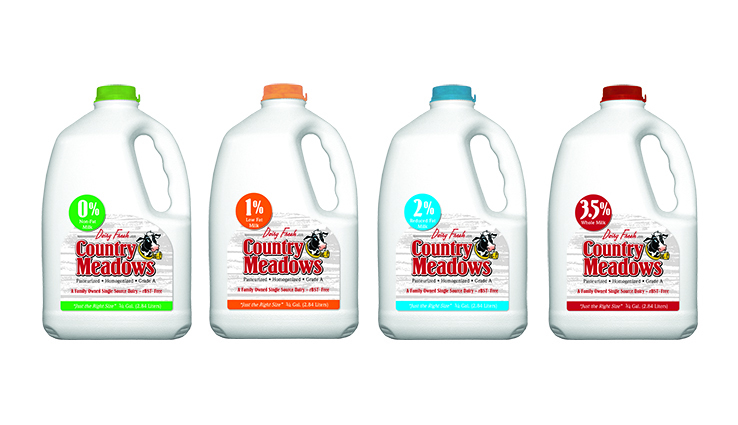 Branded as Country Meadows, these milk products distinguish themselves as a separate line to test the effectiveness of a unique line extension. 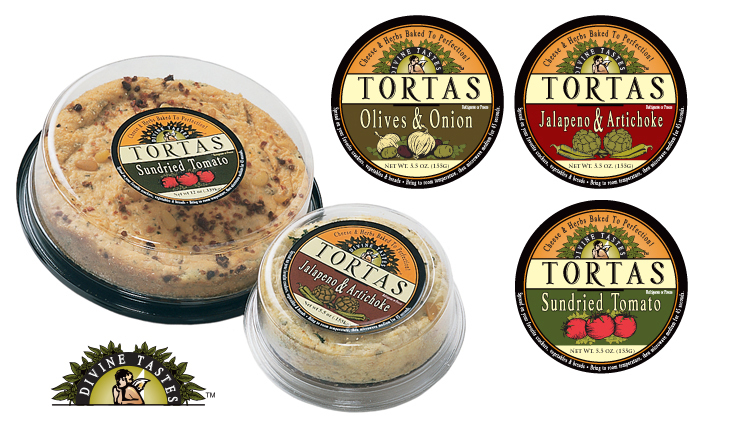 Divine Tastes Tortas, the savory cheese and herb appetizer. This specialty market product allows the consumer to view and choose the flavor of choice with nearly a full view of the Torta within. With a full process-color top label for consumer presentation and one-color utility label on the bottom, this simple design solution affords the client with cost-effective packaging. The labels fit both container sizes and the container is simply a stock plastic item container turned on its top. Marketed under the Firenza brand, these season perennials are always a hit with consumers. Made with the same great high-end ingredients as all Firenza bake mixes these colorful holiday mixes are an annual tradition. 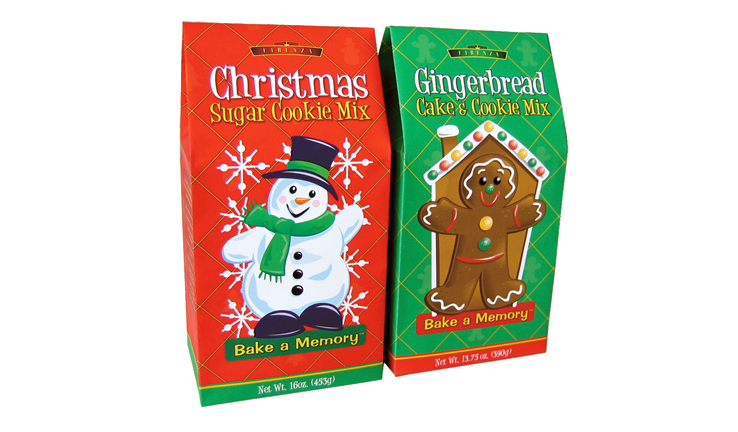 Incorporating the same gable topped packaging as the other Firenza bake mixes, these holiday designs pop from the shelf with a fun and festive theme. Masala dishes created with fresh ingredients, hand-ground masala spices and lots of love. Never canned or frozen these consumer-friendly packages offer convenience and classic home-style Indian meals ready to heat and serve. Utilizing side and top labeling these containers pop from the refrigerated retail shelf. 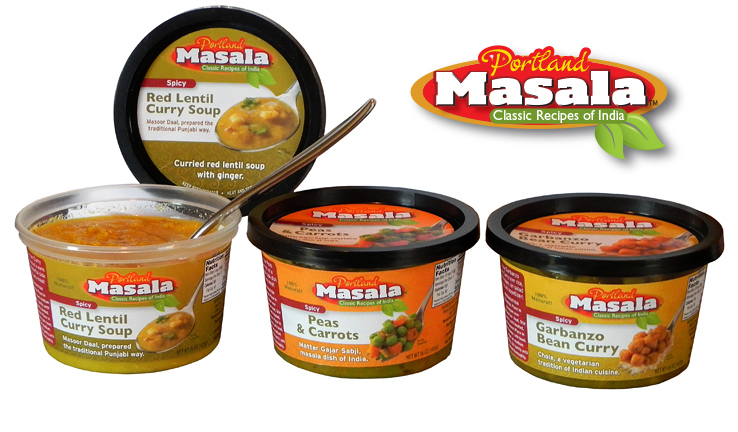 Traditional Indian base colors evoke the curried masala flavors and bold logo with close-up product image to quickly identify the product and flavor appeal. 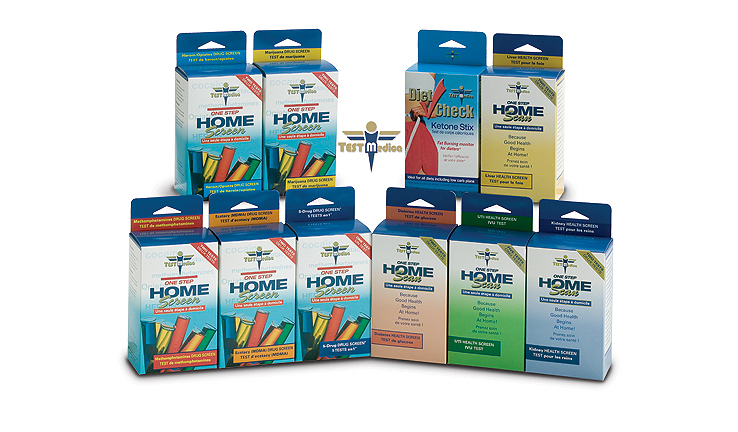 Convenient and accurate in-home and work-place drug and substance use test kits. Repositioning of packaging designs for the Canadian market that features bilingual (English/French) display panels and instructions. Point of sale packaging affords retailer shelf standing or hanging display. 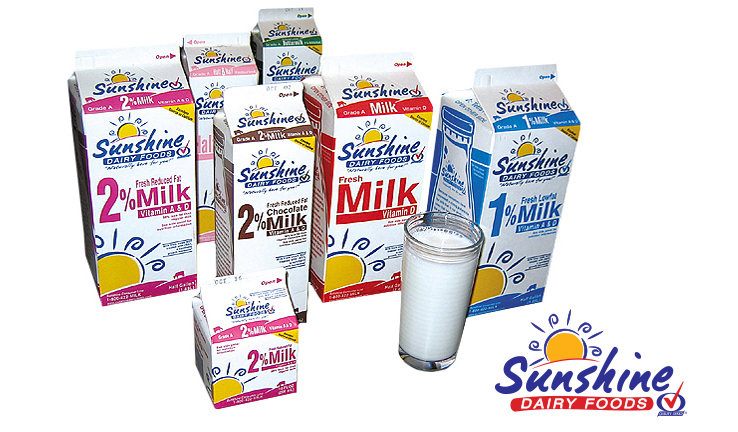 Providing quality milk products to grocery chains and food service since 1936, Sunshine dairy was ready for a make-over of their logo and consumer packaging. From half-pints to half-gallons the Tetra Pak containers were fully redesigned, as well as the one-gallon container labeling. The bright, cheery sun rising logo provides for instant recognition of this regional milk producer. 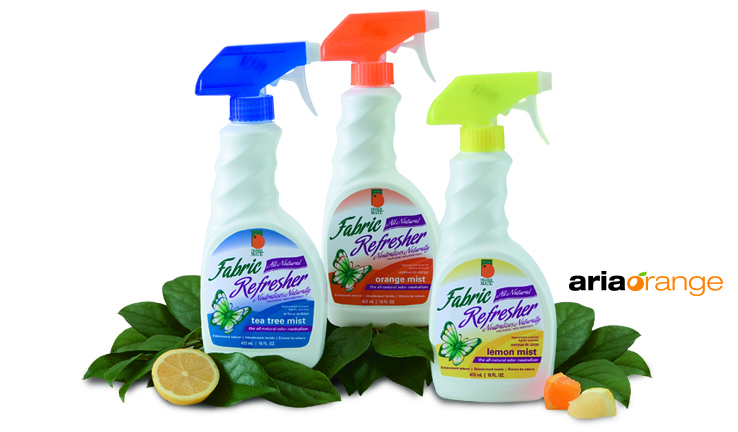 An all-natural citrus and tea tree oil based fabric refresher. Developed to serve both the U.S. and Canadian markets, these refreshers are designed for bilingual distribution (English/French). Plastic easy-grip sprayers with color coordinated nozzles accentuate the varietal citrus and tea tree scents for a strong and clear shelf presentation. All-purpose, all-natural glass and surface cleaners. Effective streak-free cleaning without the ammonia or other caustic ingredients. 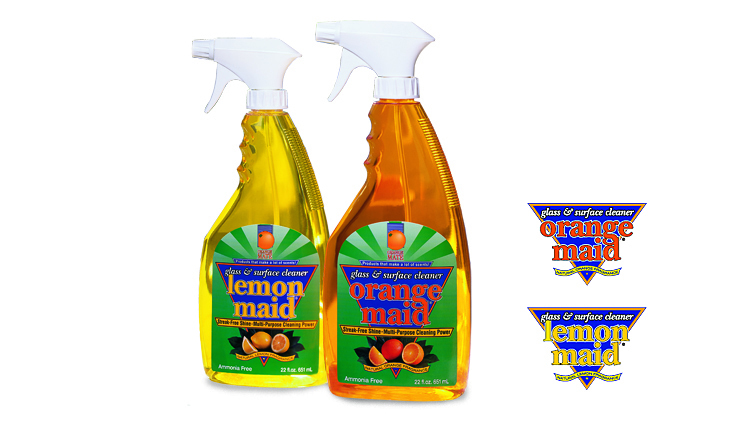 Home spun in appearance these citrus based cleaners wear full process-color flexo printed labels on the front and back of their clear containers. 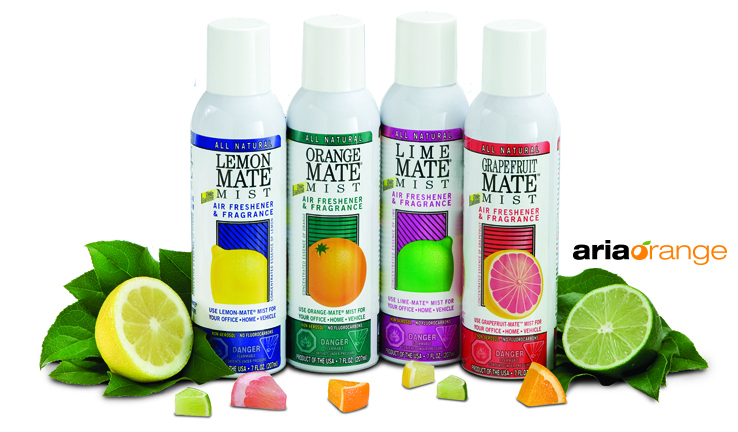 Orange Mate Mists, the original citrus air fresheners and a natural products industry leader. Non CFC, bag and valve aluminum containers are wrapped with process-color bilingual (English/French PDP's) labels. These designs incorporate the original Orange-Mate branding with strong graphic and color varietal indicators. Sauce with attitude! 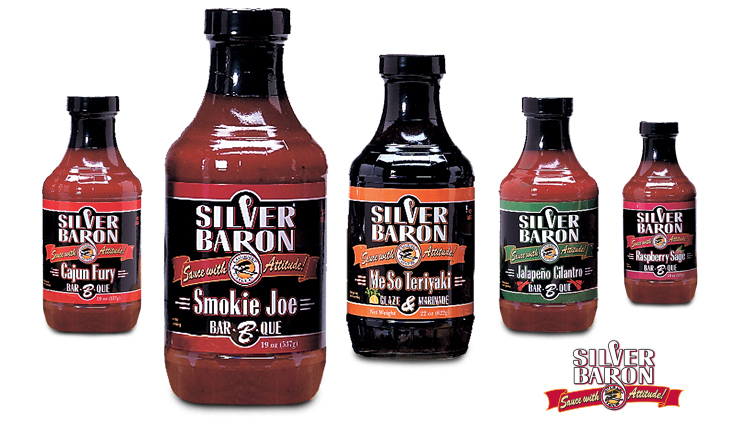 best describes these bold and flavorful sauces. Prepared in small batches, no detail is spared with the use of rich ingredients and full flavor herbs and spices. The flexo printed process and spot color labels set an upscale nostalgic feel. Each varietal flavor color is set on black to highlight the sauces natural color and make a bold statement on the shelf. Rich and creamy best describes these little slices of heaven. Divine Tastes Cheescakes are made in the traditional east coast style with the added bonus of no added sugar. 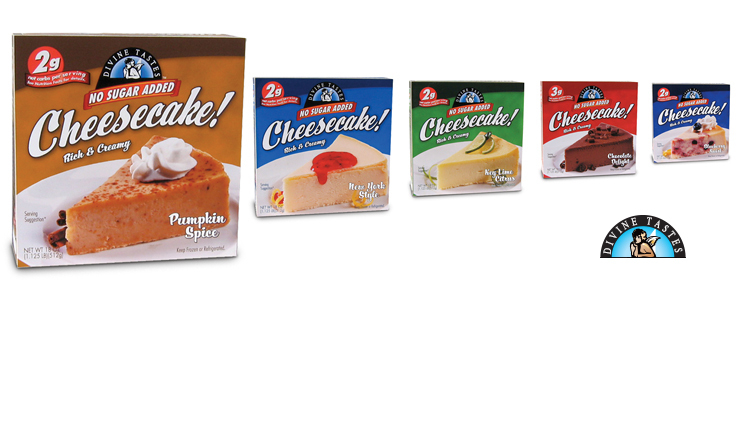 These large facing freezer packages greet you with a large slice of cheesecake, drawing you in for your first bite. Litho printed to moisture resistant stock these packages present a colorful array of decadence. 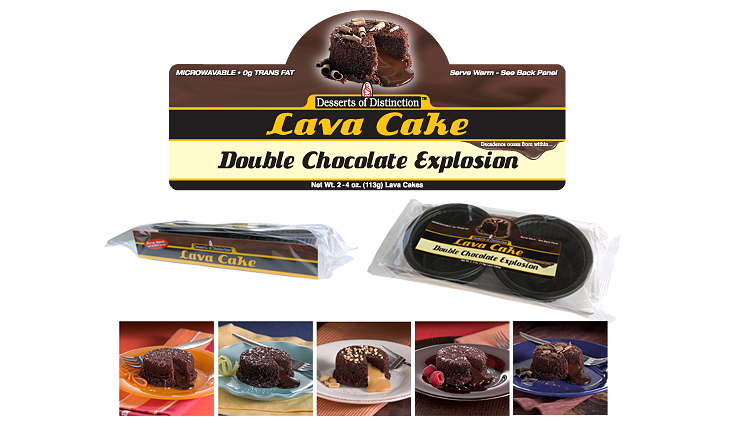 Served warm these individual Lava Cakes ooze with rich flowing goodness. Just heat, flip onto a dessert plate and serve. What could be easier to create a finish to a meal? Each cake sits within a microwavable individual serving bowl nested onto a process-color printed tray. Cello heat sealed and finished with a flexo printed label. Packaged for self-serve foodservice these little rounds of decadence are a ready to eat dessert. Each cheesecake sits within an individual size serving bowl. 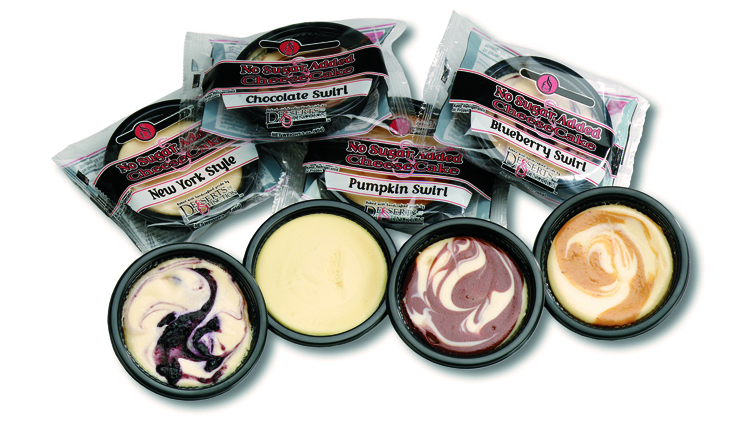 Sold frozen these cheesecakes only require a few minutes to thaw and are ready to eat. Heat sealed cello is flexo printed with two common spot colors and one variable spot color to finish up this economical little package. Morning, noon or night, the anytime bar! These healthful snack bars are loaded with naturally delicious ingredients. 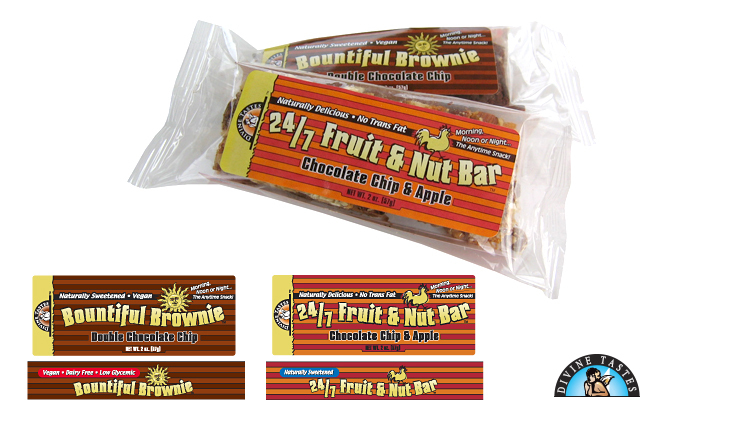 The 24/7 Fruit & Nut and Bountiful Brownie Bars are the take anywhere grab and go treat! Each bar sits on a process-color branded tray, then heat-sealed cello wrapped with further branding on an enticing flexo printed label.